This book is the eighth volume in this Collaborative Biography, which explores the life and works of Nobel Prize-winning economist F.A. 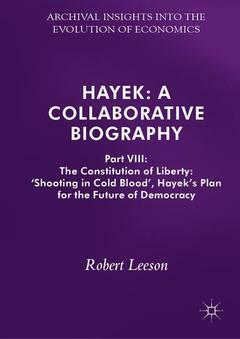 Hayek (1899-1992). Making extensive use of archival material and Hayek?s own published writings, it presents a strong challenge to perceptions of the economist?s life and thought. In this volume, chapters canvas subjects such as the relationship between the Austrian School of Economics and the Cold War, the Hapsburg Empire, and the overthrow (or planned overthrow) of democracy in a variety of countries, with a view to examining the process by which economics is constructed and disseminated. 10. What ‘things’ did Hitler ‘get done’? 11. The Unravelling and the Glue? Robert Leeson has been Visiting Professor of Economics at Stanford University, USA since 2005, National Fellow and Visiting Scholar at the Hoover Institution since 1995 and Adjunct Professor at Notre Dame Australia University since 2008. He has published numerous scholarly articles in journals including the Economic Journal, Economica and History of Political Economy. In addition to writing and editing twenty-six books, he is the co-editor (with Charles Palm) of The Collected Writings of Milton Friedman. He has held visiting positions at Cambridge University, the University of California, Berkeley, the University of California, Santa Cruz, Santa Clara University and the University of Western Ontario.